Customized to your skin type, it contains Cleanser, Toner, Exfoliant, Daily Moisturizer (SPF-30), Night Repair, Eye Gel, and Treatment Mask. Everything you need to keep your skin in healthy, flawless condition, my complete Skincare systems are customized for your skin type. 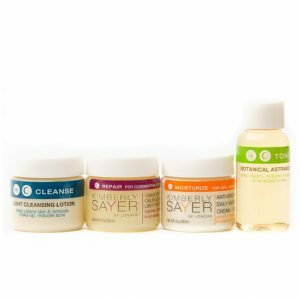 Your system will contain products to cleanse, tone, moisturize, regenerate, repair and hydrate. Includes: Gentle Face Cleanser, Pure Lavender Toner, Gentle Almond & Lavender Face Scrub, Anti-Oxidant Daily Moisturizing Cream – SPF-30 , Aromatic Night Repair Cream, Cellular Extract Eye Lift Gel, Hydrating Anti-Oxidant Facial Mask. Includes: Light Cleansing Lotion, Botanical Astringent, Gentle Almond & Lavender Face Scrub, Ultra Light Facial Moisturizer – SPF-30, Tangerine & Calendula Healing Light Night Cream, Cellular Extract Eye Lift Gel, Deep Cleansing French Clay Mask.